I don't know about you but I'm happier with a tan, there is something really nice about having a golden glow and I prefer the safer option of faking it with a tanning mousse than a sun bed. 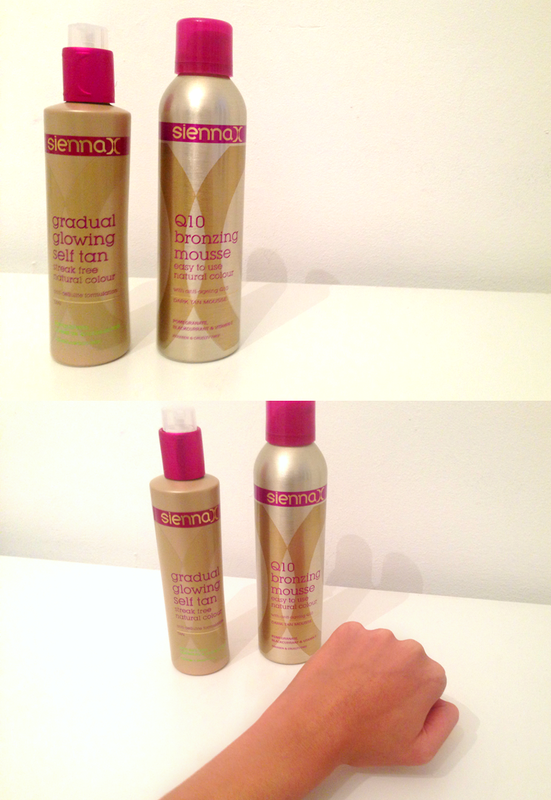 I was so excited when the lovely Sienna X team sent me their Q10 Bronzing Mousse* and Gradual Glowing Self Tan* to try! To start with, how gorgeous is the Sienna X packaging? It looks very pretty on my dressing table right now! The first product I tried was the Q10 Bronzing Mousse - the main thing I would like to point out is I prefer tan that creates a brown bronzed look - not orange. I think a lot of tanning brands can forget this and I love developing my tan over time so it's essential for me that the shade develops in a bronze shade. Sienna X have officially nailed this concept on the head, the scent smells gorgeous, (hello cocoa butter) and the application was very easy, it was very simple to develop on my skin and blend in. I used a tanning mitt to apply the mousse - I only found out that you can actually pop your tanning mitt into a washing machine, I just used to throw them out!